Mending, filled with modelling clay (painted), varnished. Cinerary urn. Flat bottom. Cylindrical body, leaning to one side, tapering toward rim. Horizontal rim with piecrust. Vertical, rounded lip. Traces of attachments for two horizontal strap handles (W. 0.090), pressed in at center and round in section, on body at 13 cm above bottom. Two horizontal grooves around body at level of handles. Three registers of painted decoration in horizontal bands on body (from bottom to top): thick red straight band; red, tall wavey band; thick red straight band; red, shallow wavey band; red, thin, straight band; red, shallow, wavey band; thin straight black and thin black white band. Fabric: 2.5Y 8/3. Paint: 5YR 6/4, light reddish brown, to 2.5YR 5/6, red. Coarse, hard but brittle fabric has common, very small, subangular, black inclusions and rare, medium, rounded to subrounded, red to gray chunks. Fired clay has very thin, even, matte slip same color as fabric. Uneven, matte slip painted on thinly in lines and waves around body, slightly flakey. 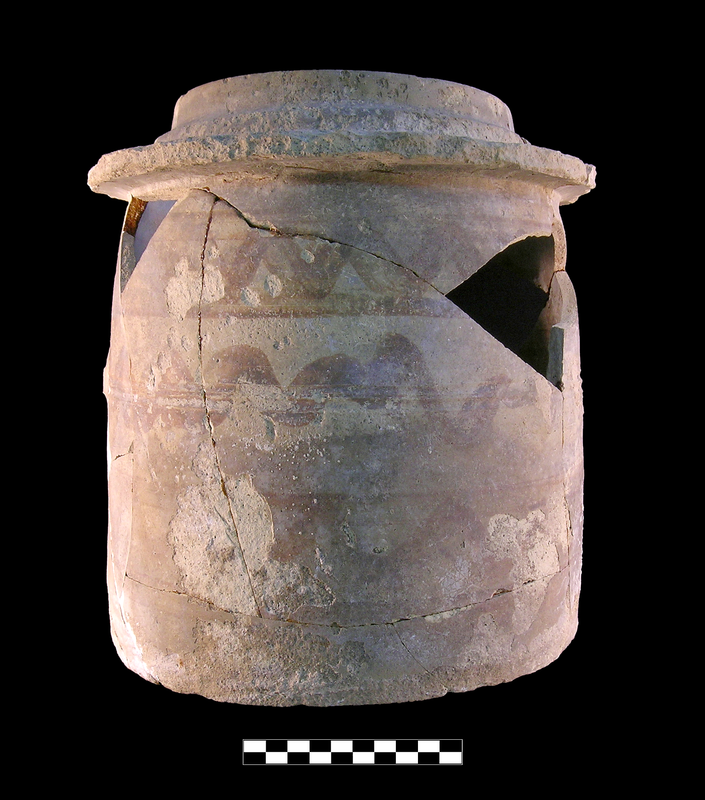 Nine joining fragments preserve over three quarters of vessel; for matching lid see KP1969-014. Slight-moderate, somewhat extensive abrasion, pitting, and gouging; slight, extensive encrustation and slight discoloration. Erosion around top: moisture?